Gorman-Rupp’s Prime Aire Plus line. 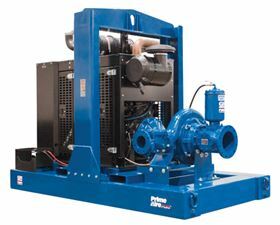 Gorman Rupp's Prime Aire Plus line is available in sizes up to 8 in (200 mm) flanged discharge sizes and provides flows up to 1124 m³/hr (4,950 gpm) and heads to 145 m (475 ft). These pumps are suitable for clear liquids and liquids containing large solids and can fit other pumping installations. All Prime Aire Plus pumps are available coupled to the EPA Tier compliant engines or premium efficiency electric motors.